I have recently upgraded all clients on my network to Windows 10 ver 1803 x86 from 1703 x86. I am now having an issue where when I connect to a remote client that has used the Windows 10 scaling feature to scale their screen up a percentage my viewer pointer does not line up with their actual pointer position. It seems to be offset proportionally by the percentage they have scaled the screen. The mouse pointers line up in the upper left hand corner of the viewer but as you move away from that location the pointer on my screen gets further and further away from the actual pointer on the remote's screen. This makes it impossible to work on the remote screen as my pointer does not line up with where it is on their screen. I have upgraded a computer to UltraVNC 1.2.2.2 x86 and my local computer to 1.2.2.2 and this does not fix the problem. This did not happen when the clients were on Windows 10 1703. Thank you for the great product. Hope this can be fixed soon. I wanted to add one more thing. 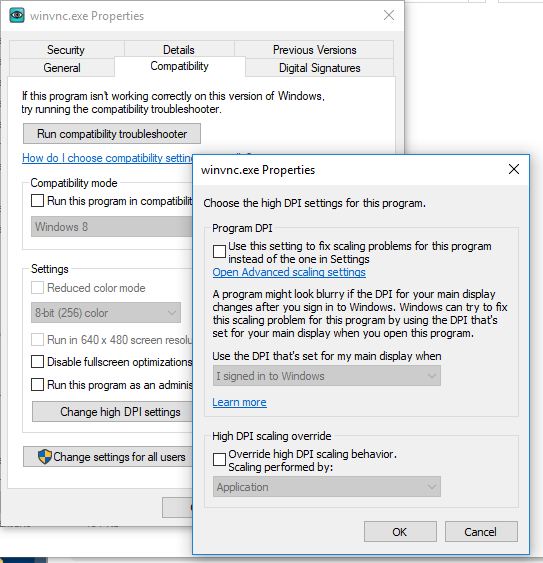 If I get the remote user to restart the PC while I am connected and my viewer stays open trying to reconnect, once it reconnects the pointer is in the correct position and I can successfully control the remote PC. let server or viewer handel the cursor. Do both methods have this issue ? Hi, thank you for your fast reply! If I set the viewer to "let remote server deal with mouse cursor" then my little dot is the actual cursor position but the arrow displayed on the screen moves around as if it is a percentage (like the scaling percentage) away from the top left corner of the screen. So when I am close to the upper left corner of the screen then my dot and the arrow are very near each other. But as I move away from the upper left of the screen, the dot and the arrow move together but they get further and further apart as I move further away from the corner. Since my dot is now the actual cursor location with "let remote server deal with mouse cursor", then I can use it like this, but its not ideal. If the remote computer is rebooted after the scaling change, then it always lines up like it should. Until someone else logs in with a different scaling setting. Then the computer needs to be rebooted again, and then cursors line up again. So what I have been doing is, if I remote in to a remote computer, and the mouse is offset, I just have them reboot their PC if they can. When I remote back in after the reboot, then the mouse lines up. I know it isn"t a solution, but it already narrow the cause. I've only noticed that it happens after the scaling has changed on the computer. We have computers where multiple users log in to that computer. Some users like the setting to be nice and big, so they have their profile set to 200%, then another user may log in to that computer and their scaling is only %100 or some other number. So it seems that when the scaling changes due to what ever user logs in, that's when the cursor is offset. I had not tried adjusting the scaling while I was on the remote computer, but I just did, and it did offset the cursor. So I rebooted the computer and logged in again and the cursor is now in the correct position once again. Maybe a related problem. I get a screen full of horizontal black lines on some machines. Logon screen is normal. Also when an UAC sceen is show I see it normally and after I entered credentials, screen stays normal. I think it's related to custom scales. This bug is still happening on version 1.2.2.4 compilation on 2019-02-18. First time the connection is made to a W10 machine 1709 with 125% scale, the mouse is off position. If I restart the service on the W10 machine and let the client re-connect, then it is OK.
Edit: I cannot reproduce the issue again. It happened only once. So it seems very random. The W10 system was on 1.2.1.7. I upgraded to version 1.2.2.3 and the mouse offset was there. After seeing that, I changed to version 1.2.2.4 from 2019-02-18. It was yesterday and was OK.
Today at booting both machines it happened once on version 1.2.2.4, but I am unable to reproduce it again. The mouse offset was there, no matter how many times I restarted the client. After restarting the server, everything was OK, but now I cannot reproduce the issue anymore... ¿?¿?¿?